Somali President Hassan Sheikh Mohamud took part in a town hall hosted by VOA's Somali service Saturday and moderated by journalist Abdul Hussein Osman, in Mogadishu. "I assure all Somalis that the insecurity will be handled soon. We are after the terrorists,” President of Somalia, Hassan Sheikh Mohamud, told the Somali diaspora in a first-of-its-kind town hall meeting hosted by the Voice of America. The Somali diaspora in Minneapolis-Saint Paul had a rare opportunity to speak directly with the Somali President. The interactive discussion linked audiences at Twin Cities Public Television station KTCA-TV with the Presidential Palace in Somalia. In both Minneapolis and Mogadishu, Somali youth and community leaders asked the president questions on extremism, unemployment and education. 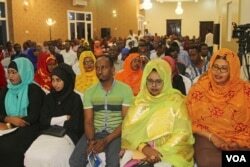 The program aired on Somali National Television and streamed live on the VOA Somali web. The Facebook Live stream had more than 36,000 views and contributed online questions to the president. Ayduruus Ahmed Abdirahman, a teenager in Minneapolis, asked the Somali president in English how he would make the country safer so that kids like himself would be able to return to their parents' homeland for vacations. "We’re tired of going to Ohio or Seattle for vacations when we have so many beautiful cities back home. But we hear about things blowing up there every day," he said as the crowd applauded. “You can come back to Mogadishu and nothing will happen to you," Mohamud answered. Mogadishu residents taking part in a town hall hosted by VOA's Somali service Saturday conversed with Somali President Hassan Sheikh Mohamud in Somalia and residents in St. Paul, Minnesota, home to the largest Somali community in the U.S.
Mohamed Dahir in Mogadishu accused the Somali President of failing the youth of his country saying that young people are joining terrorist groups because the President “does not give them a chance to represent themselves in the government institutions.” “I take responsibility for whatever relates to my responsibility, but I have also to get credit for what I did," said the Somali president. "Four years ago, when I was coming to office, the terrorists were threatening the government, and now you see our army is hunting [them] down in their remote hideouts,” Mohamud responded. VOA Somali reaches Somalia and neighboring countries on AM, FM, shortwave radio, the Internet and mobile devices. The service's radio programs take an in-depth look at a wide range of Somali affairs, including political and social issues, health, development, music and culture. Panel discussions, debates, interviews with newsmakers and call-in programs encourage Somali to express their opinions on topics of interest. VOA Somali is heard by more than half the population of Mogadishu and reaches as many as two million members of the Somali diaspora worldwide.